Great Quality Solar Lights on Sale! High Quality All Season Solar Lights! free-light Solar Lights are skillfully designed and built to provide many years of reliable use and outstanding light output. All free-light solar lighting products have been manufactured to work in North American climates and all four seasons! Browse our best sellers and take advantage of our Summer Sizzler SALE prices in many free-light categories. But hurry! free-light solar lighting products wait for no man, woman (or beast). VICTORY2 solar light is a contemporary bright solar light design that will bring a gentle radiance and flair to your home. The 'VICTORY2' solar light is a spectacular addition around the pool, deck, or yard... wherever you want to create the perfectly lit atmosphere. You'll love the solar light style and functionality so much it will leave you looking for more places to put this bright solar lamp. Turn it on when you unbox it and it is ready to go. SOLAR. no wires... ...just add SUN. See the VICTORY2 versatile solar light. Perfect solar light for the darker areas around the house, cottage or camp. The shorter stature of this super bright solar lamp, keeps the light lower to the ground. Whether installed on your deck, sidewalk, stairs or garden, the BEACON solar light will illuminate your path with unrivaled light output. This rugged, versatile solar "mushroom" has too many applications to begin to list. Did you know? Raising the solar light higher from the ground gives a much larger pool of light. See the BEACON and step into its light! CAPITOL by free-light will put out up to 15' of constant brightness light from a compact light body. Great solar light for entrance and pathway illumination. Easy to install. Bolt the battery bracket in place, turn on the power switch and attach the light body to the battery bracket. Automatically turns on at night, and off 5 hours later. Reach new heights with solar lighting and free-light's CAPITOL. See it here. Lots of light from a stylish shaped solar light fixture that fits in any location. 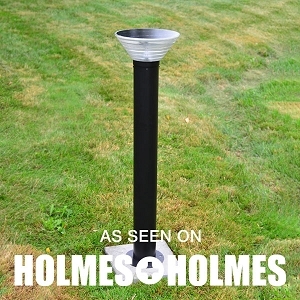 Millenia - .8M Tall Solar Pathway Light, lights up to 30'. Just so you know, .8 meter is 31.5" high. The Millenia turns on automatically at dark and turns off 5 hours later. Large crystalline solar panel keeps the dual 30W batteries charged each day. Easy installation. From box to working in minutes. NO assembly required. Aluminum construction combined with free-light solar technology makes for a reliable and bright light! Get more information on free-light's Millenia solar light for walkways, pathways, courtyards and more. Great near stairs or entrances, rings of the SATURN solar light illuminate the night with 30' of light. Now that's a lot of light! Easy to install, 1M (or 39") tall, the SATURN has as many applications as you can think of... driveway, sidewalk, entrance, patio, deck, stairs. Made of stainless steel for long life. SATURN by free-light is a galactic odyssey. Discover more about SATURN solar powered outdoor light here. Featured on "Holmes Makes It Right ... If the Shoe Fits and Mikes Ultimate Garage" episodes. the ECLIPSE2 is the brightest solar garden/deck/pathway light we make and is the perfect solution where you want one powerful solar light to thoroughly brighten a specific area like a dock, gazebo, stairs, or patio. The ECLIPSE is a constant brightness design so it will illuminate the area with the same brightness for all 6 hours. No glare. Lights up to 60' diameter. free-light ECLIPSEs every competitive product on the market in terms of brightness and longevity. See the ECLIPSE solar light and how it will brighten up your night here. 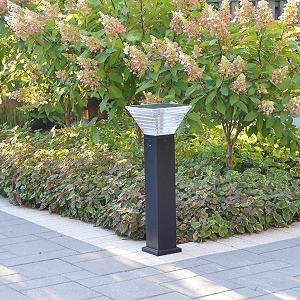 TRIUMPH pathway solar light is elegant and refined and oh, so versatile. Bright and beautiful solar lights. This entrance, pathway, brick column solar light is easy to install. Dome top allows snow, leaves to slide off the solar panel so it can charge properly every day. Large 3.2W mono solar panel charges the battery via our proprietary electronics. Learn more about free-light's triumphant TRIUMPH outdoor solar light here. Want to see more beautiful free-light designs for your home, cottage, camp, or trailer? Browse our complete catalogue today. And while you're there, read our solar lighting product reviews, and feel free to add one of your own! We'd love to hear from you.